With the endeavor and commitment of generations of great figures in the history, Zhongshan has become an agreeable city to live and a leader in commercial and cultural development nationwide. 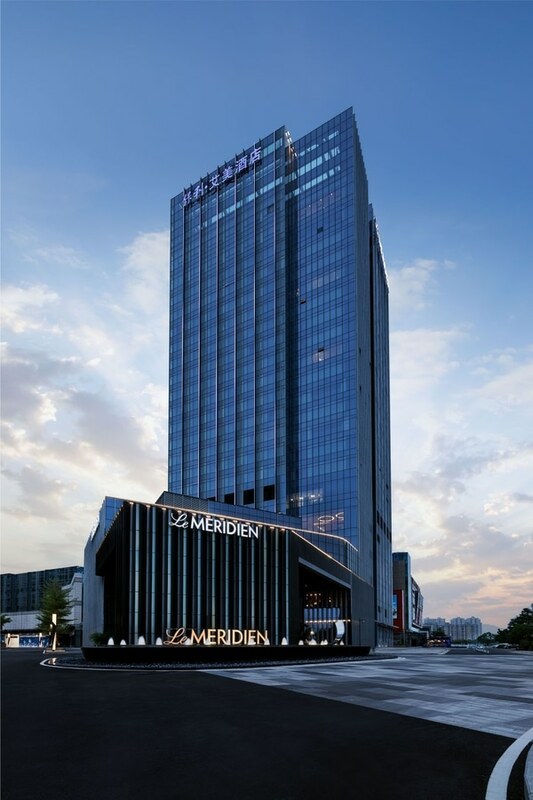 Le Méridien Zhongshan is located in Gangkou Town of Zhongshan City, with monuments, temples, modern shopping malls and verdant wetland parks all close by. 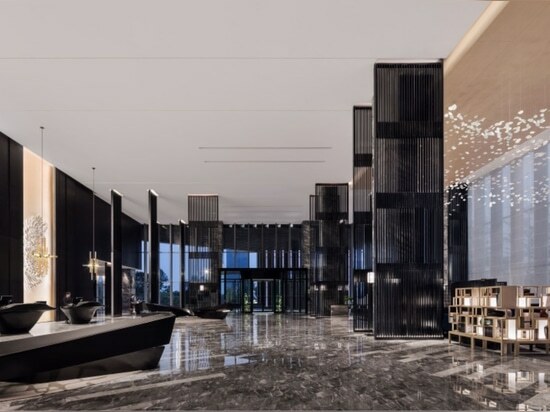 As the first five-star destination of business trip in North Gate of Zhongshan urban area, the 100 meter high-rise of 24 floors is regarded as the most impressive skyline of Gangkou Town. 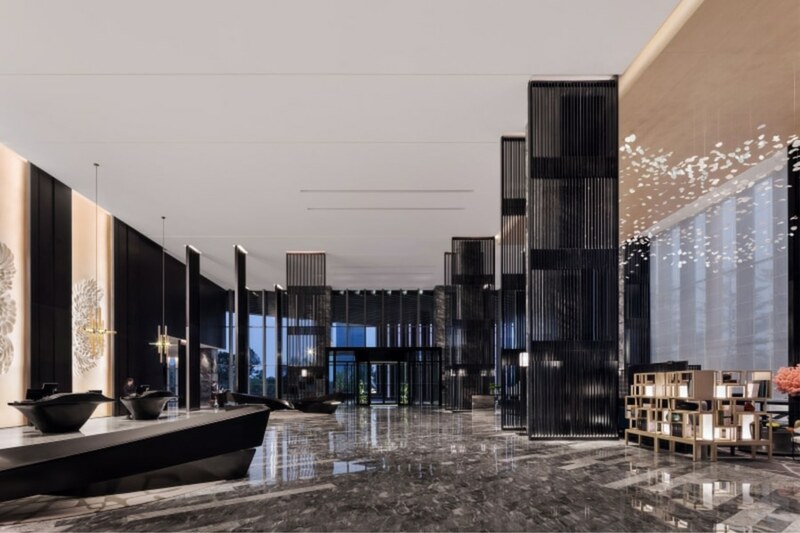 BLVD always treat entrusted projects with good-will and resolution by exploring the past of the city and savor locally exclusivehuman and social cultures, the design approach perfectly aligned with “Destination Unlocked”, the brand idea of Le Méridien. 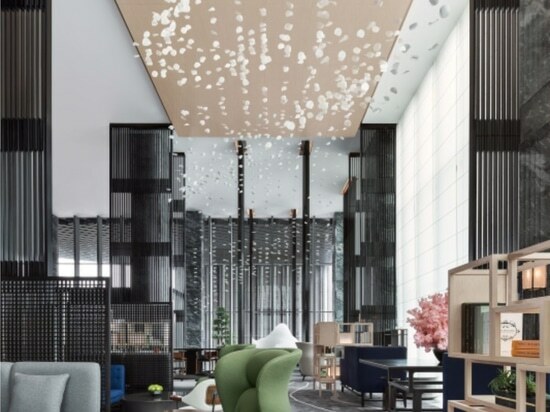 The design unveils the cultural glamour of this historic town with new visions, throwing guests to the past when the city was called Heung-san. 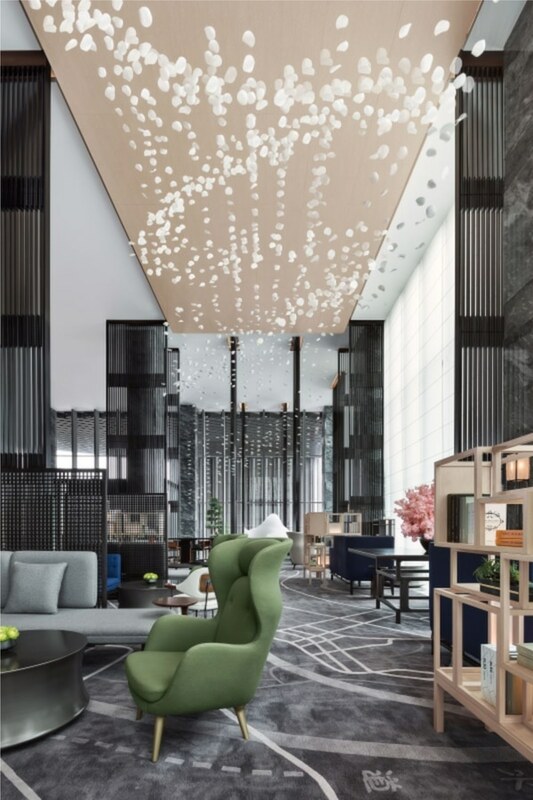 Inspired by “mountains”, it infuses fun and excitement into the hotel and arouses curiosity and a spirit of adventure with French elegance of Le Méridien. The full-high lobby in a dark timber tone is cut by solemn arrays of screens, adding to the steady style. The acrylic mountains at the entrance and in the end offer a mystic and blurry hill view through water vapor after a nice rain. 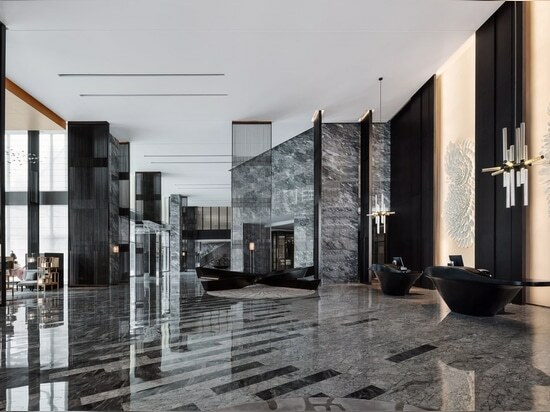 The water flows on the floor stone reach the walls seaward, turning the lobby into a veritable microcosm of Zhongshan landform of plains, hills and rich water system. 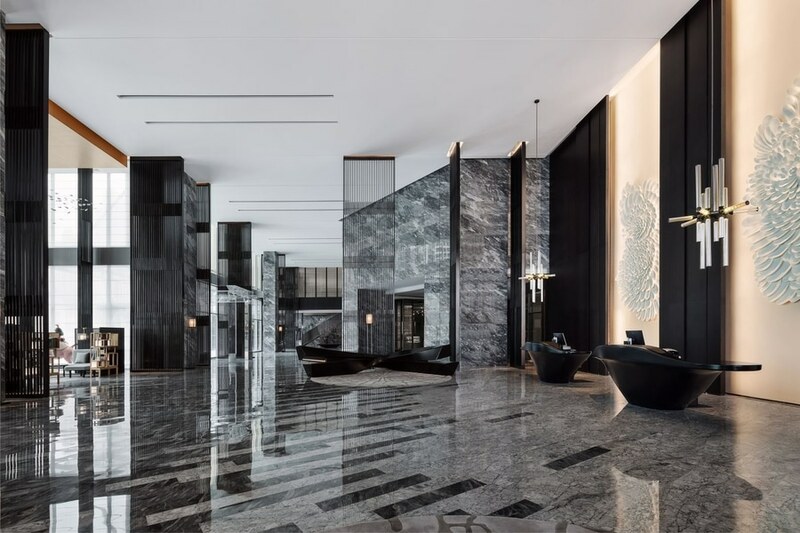 The three free-standing reception counters, a rebel against ordinary design, taking the reflection of mountains in the water, rest gracefully on the grey marble as an offset to the deep space and a feature of fun and creativity. In the background, the spiral shapes of pearly nautilus consisted of glass steel chrysanthemum petals vary from each other, making the reception area more diversified. High-back chairs and grilled screens of Chinese style enclosed another part of the lobby as a library to exchange thoughts and inspirations for people with creativity.The crossed lines of the glorious past of Heung-san on the carpet facilitate the exploration of the past and the present of the city. The hanging petal accessory arranged in a random yet orderly way stands for the solidary quality of all Zhongshan people who have contributed to the local history. 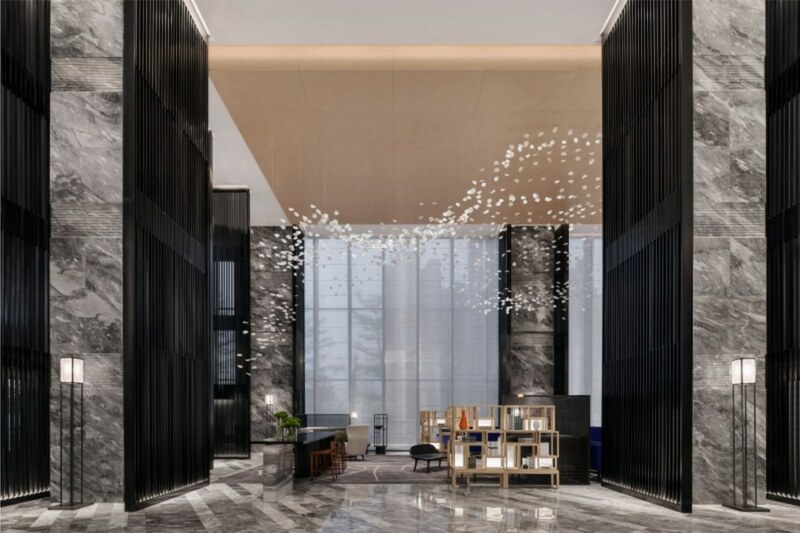 A green artwork freezing a mountainous view as a transition from the grand lobby to the lower lift lobby would always excite guests like a utopia at the end of narrow opening, triggering them to explore further of the space. Taking the stairs up from the mountain foot to the peak, you will be greeted by a celestial stone by the window, shutting all the noise and trouble out; together with the violet-flower carpet of grace and sophistication, all you can feel is an unspoken tranquility. 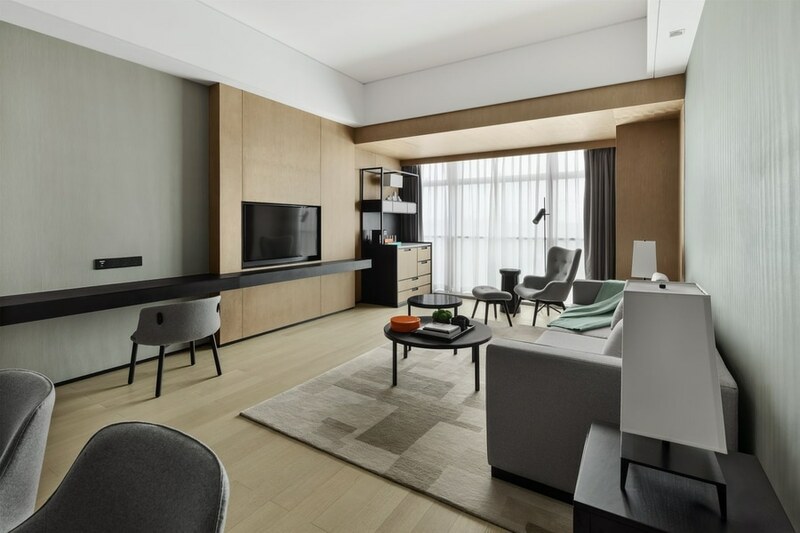 The guest roomof simple lines and clear-cut blocks in subdued colors with plain material combination of modern design as well as traditional details is designed to be calm and comfortable. 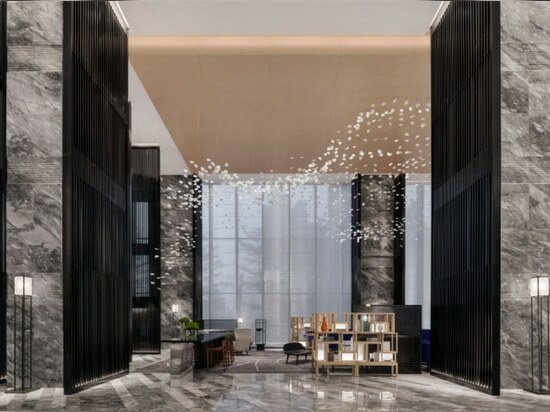 The screening at the foyer provides a fresh visual excitement by emulating andsimplifying the pierced door panels of ancient Zhongshan buildings. The old wood sourced from Guhe Village, a witness to Zhongshan history is hand carved into a feature against the sofa. The unpolished traces of carving andbleeding colors manifest the locals’ wisdom in life and pursuit of aesthetics. 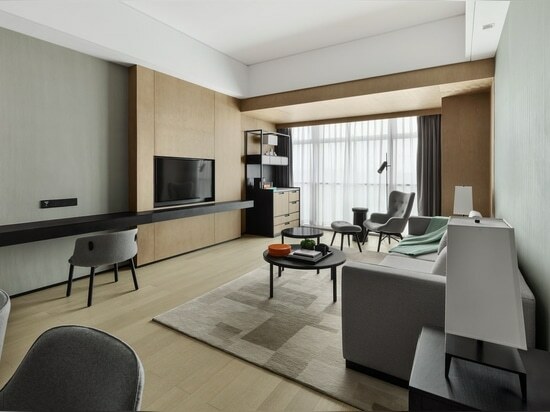 Quiet yet sophisticated, the independent big study lacks no detail or delicacy. Abstract images of local attractions like the Sun Yat Sen Park, the Zhanyuan Garden, Zhongshan Movie Town, the Jinzhong Reservoir and the Xishan Temple unroll the history of Zhongshan on the wall. 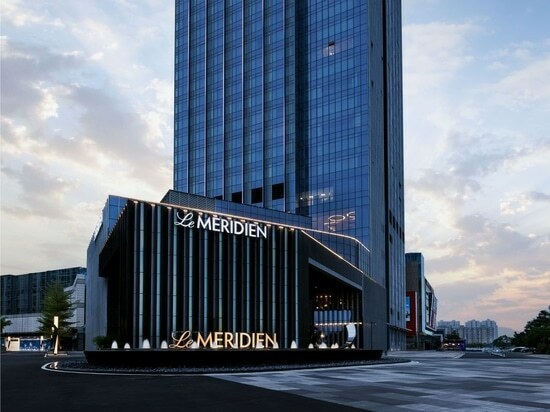 All this proves to be the epitome of the elegant, light luxurious and creative DNA of Le Méridien. Separatingthe bathroom and bedroom with translucent grill partitions instead of solid division connects the two spaces to a certain degree, making the view of the room deeper and airier. Each city is a living being that constantly evolves. The designers present the characters of Heung-san, in a minimal and special French approach, subtly introducing comtemporary aesthetics into this time-honored city. The encounter of old Heung-san and new Zhongshan is an earnest answer to hope for the future, driving the eternal exploration of urban mysteries by human kind. Source by BLVD International.